The Brand Dharma | for the Design Sangha. As with so many tactics, we too often take a “build it and they will come” attitude toward Facebook fan pages. Truth is, driving traffic to those pages is a lot tougher than launching them. With that in mind, Justin Wise of Social Media Examiner shares 20 ways to promote your Facebook fan page. It all starts, of course, with putting a link on your personal Facebook profile. Then, add the fan page URL to your email signature, your business cards, your Twitter profile, your Keynote or PowerPoint slides, and anywhere else that’s relevant. Tag other popular fan pages in your updates. Place a widget on your blog and/or website. And tag your YouTube videos. Invest in Facebook ads, which are easy and pretty cheap. And use targeted keywords in Google AdWords. 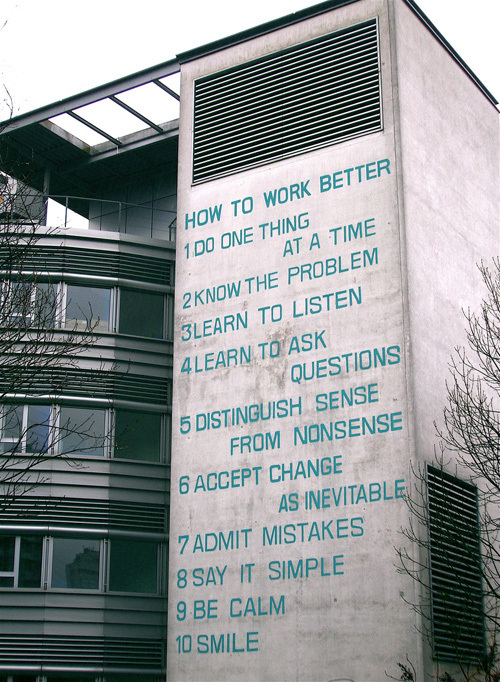 While these guidelines have been spread widely across the web and adopted by countless organizations and individuals, credit goes to Swiss artists Peter Fischli and David Weiss who created this 10-point manifesto. It certainly has relevance for all of us who are constantly refining the process of brand development. So many times a client comes to us with the need for a refreshed website, a print mailer, or a new look for a presentation, product packaging, or trade show. And like so many design professionals, we often jump right in with the visual design and content development. That can be a mistake, however, if the client hasn’t really identified their target audience and positioning in the market, or defined their own brand identity and how their offerings provide true benefits to customers. And that’s when we find the collaboration bogs down, direction shifts, and frustration starts to build. The problem is, we have no true guide that can direct our design processes. We’re driving somewhere new without a map. We all know how to ask our clients: “What is it you do that’s different, and why is that important?” Yet too often we include these valuable discussions as part of our design process. At Indigo Creative, we try to begin any new project by taking a step back from the requested website, print piece, or other tactic. We ask to review our client’s current brand identity, and create a “brand platform” that will serve as the foundation for all of the design and messaging that follows. In that platform, we provide a snapshot of where our clients are at currently and what opportunities they are targeting. We define three key components that make up their core brand identity. We help them position themselves in their market, and review their competitor’s brand positioning. And we start to develop visual “look and feel” concepts, along with preliminary taglines and messaging that express the brand. This brand development process inspires our clients to take a good close look at themselves, and really define what they’re all about. It’s heavy lifting, but provides valuable benefits. Once we have this brand platform in place, then just like an ad agency’s creative brief, all design and messaging decisions can be developed based on its findings. The other key advantage is that we now have an agreed-upon guide, a “Brand Bible,” for all tactics that follow. There’s a consistent visual design that is shared by the website, the print collateral, the digital media, and all other client-facing tactics. And as we’ve learned, consistency is essential to building a strong brand. Fathom Business Events specializes in staging corporate presentations in movie theaters. It’s an opportunity to share specific messaging in a focused environment. They’re also big believers in the power of storytelling, as this wonderful promotional piece illustrates. With all the new posts we’re getting from Tumblr, it’s nice to see some fresh thinking within the design community. Here’s a graphic that’s been making the rounds lately. 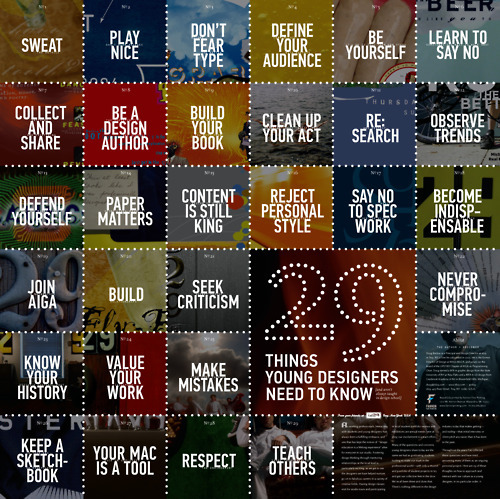 Doug Bartow and his colleagues at id29 have come up with a list of 29 things they think all new designers need to know. The list appeared in the January 2011 issue of HOW magazine, along with a limited edition poster designed by id29. While we marketers and brand architects are enthusiastically embracing all forms of social networking, it’s curious to see new studies that reveal some of its shortcomings. Perhaps it’s no real surprise, but an international psychology journal recently found that an individual’s success in the virtual world doesn’t appear to carry over into the real world. In other words, spending a lot of time online through instant messaging and social network sites was not linked to having a larger number of “offline” friends. Previous studies were mixed, with some suggesting that online networking had a negative effect on social life, while others believed it broadened social circles. The idea that social media may have little effect on real-life relationships may prompt us to wonder about the effectiveness of our branding and marketing efforts that rely on Facebook, etc. to spread the word. There’s so much to like about this. First off, they use video effectively rather than rely on text. It’s all delivered in plain language. They feature their own people creatively. And they take ownership of every single word. Rackspace offers managed hosting, and cloud hosting, but it doesn’t really matter. It’s the human element that comes across. can be reached at his Laguna Beach studio, 949.497.3179, or by using the form on the Contact Me page.